I have a cousin who makes the best homemade sauerkraut I’ve ever tasted. It’s so good that when I’m gifted with a jar, I snack on cold sauerkraut all by itself. If your only exposure to sauerkraut is the commercially prepared stuff in the green supermarket cans, I understand your skepticism. Homemade sauerkraut does NOT taste like that… really. You’ll just have to pick up a head of fresh cabbage, follow along below, and trust me! I’m not using my cousin’s recipe today because I don’t want to bother him for instructions right now. He’s in the middle of finishing a Master’s Thesis, and has my sympathy! Finishing a thesis is like childbirth or a root canal… in hindsight you might be happy you’ve gone through the process, but that’s only because the human mind has ways of blocking out parts of those experiences! I digress. Rather than pester my cousin, we’re just going to give this a go with a few heads of purple cabbage, some salt, and a crock pot. A crock pot? Yes. We’re not actually plugging it in – we’re just using the crock itself as a fermentation vessel. There’s really no need to buy a fancy fermentation container – waste not, want not! The process is simple. Salt pulls the water from slices of fresh cabbage. The salt, water, and cabbage undergo lacto-fermentation pretty much all by themselves – all we need to do is weigh down the cabbage and make sure it stays covered with the fermentation liquid. That’s it. In as little as three days, you have crispy kraut! 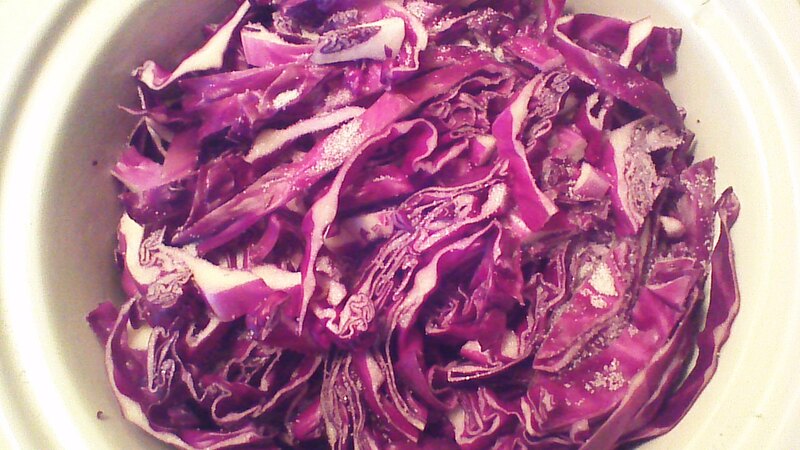 Step 1) Wash and slice your cabbages into thin shreds. Save a few outer leaves for step 4, below. Don’t use the cores at all, they’re too tough – just toss the cores in your compost bin. Step 2) Place the vinegar in the bottom of a scrupulously clean crock pot. Step 3) Layer 1 inch (no more!) 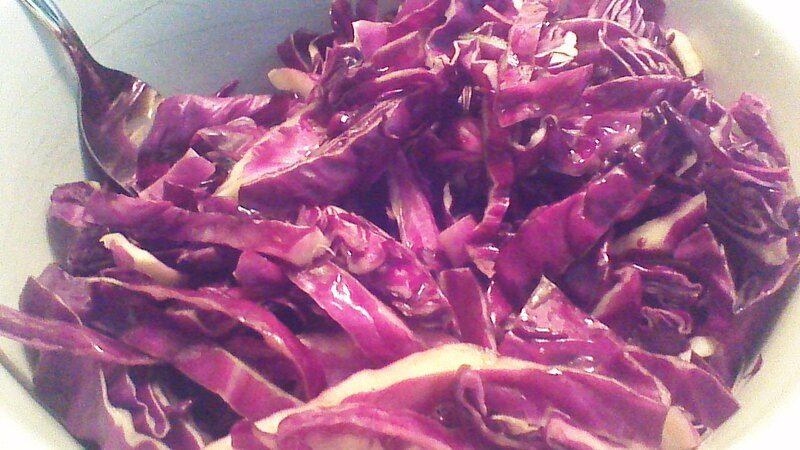 of shredded cabbage and 1 tablespoon of salt (no less!) in the crock pot. Repeat layers until cabbage is used up. You may find that you need even more salt… do NOT skimp on the ratio of 1 tablespoon of salt per inch layer of cabbage. The salt is what prevents harmful bacteria from growing during the fermentation process! Step 4) Cover your crock pot of salted, shredded cabbage with a few reserved cabbage leaves, being careful to completely cover the shredded cabbage along the sides of the crock pot. Step 5) Now, weigh down your cabbage. 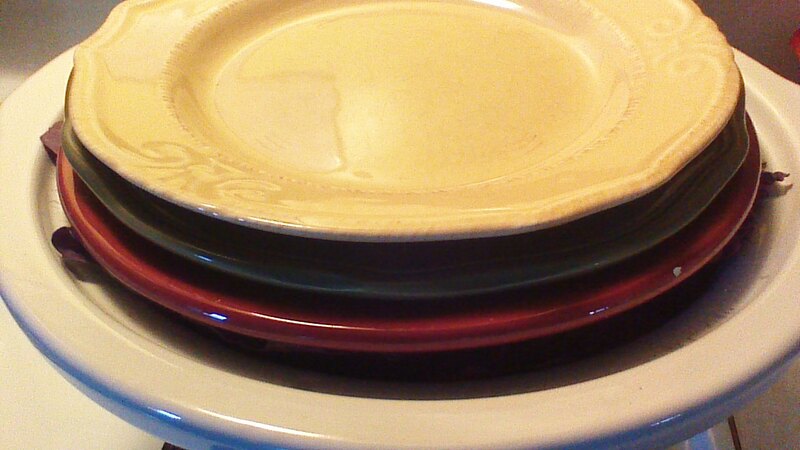 That’s right – find a few clean salad plates and just stack them on top of everything to press down on your cabbage. Between the salt and the weight, your shredded cabbage will release a lot of liquid in just a few hours, which is exactly what you want to happen! The liquid and the salt will create a brine, and you want ALL of your shredded cabbage to remain underneath that brine! Step 6) When your cabbage is below the level of the crock pot lid, place a clean, thin towel over the top (remove a few plates if necessary, but leave at least one in place). 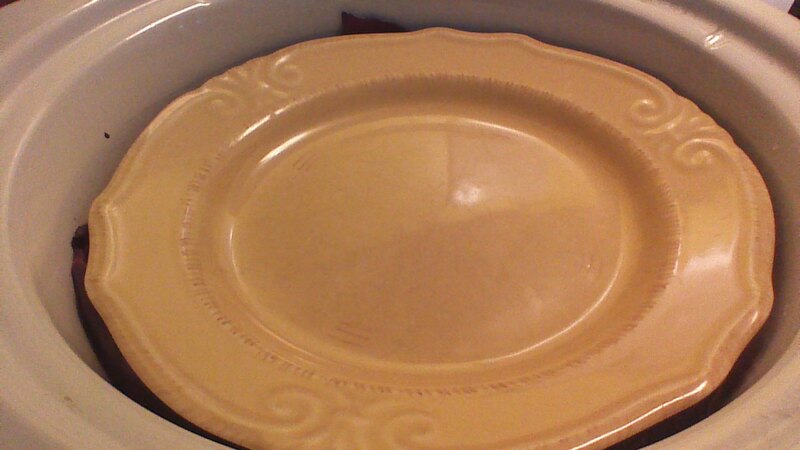 Cover with the crock pot lid, and wait. Just let this sit on the counter at room temperature. Step 7) Wait some more. Step 8) Somewhere between Day 3 and Day 7, the magic happens. Lacto-fermentation occurs, resulting in a delicious tangy taste and an abundance of healthy probiotics. The flavor (and the concentration of probiotics) will grow during the week – when the flavor is strong enough for you, transfer your kraut to the refrigerator and consume within the next two weeks. NOTE: Check your kraut before you taste it! Fermentation is pretty safe, especially with a lot of salt and a little vinegar, but spoilage (especially due to air exposure) can occur. If your kraut smells bad, looks slimy, or shows any sign of mold, THROW IT AWAY and start over! Crowded Earth Kitchen is not a wasteful kitchen, but saving a few dollars is not worth making yourself (or anyone else) sick. Agreed? This entry was posted in Fruits and Veggies, Vegan and tagged Cooking, fermentation, Food, gluten-free, Homesteading, recipies, Vegan. Bookmark the permalink.